Operation Grapes of Wrath was a two-week Israeli military campaign in Lebanon launched in mid April of 1996. The operation was meant to put stop to Hizbullah's incessant Katyusha fire on the Israeli communities adjacent to the Lebanese-Israeli border. Hizbullah escalated both the rocket fire on Israel's north and its operations against the Israel's Defense Forces in southern Lebanon all through the beginning of 1996. The seemingly never-ending cycle of rocket fire and military strikes eventually culminated in one rocket salvo which resulted in 38 Israeli casualties. The incident is believed to be the final catalyst for the operation. 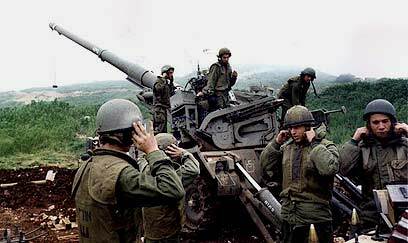 IDF forces were given the green light to strike Hizbullah on April 11, 1996. The military immediately began targeting infrastructure and terror hubs in southern Lebanon using artillery fire and fighter jets, with the Israeli Navy providing backup and effectively seizing the waters between Beirut and Tyre. The purpose of the area's shelling – designed to minimize any harm to civilians – was to drive the civilian population away, believing it would prompt both the Lebanese and Syrian governments to curb Hizbullah activities. The Air Force was able to neutralize Hizbullah targets all across Lebanon, but still, the Shiite group was able to keep firing Katyusha rockets on northern Israel. The operation would eventually see hundreds of rockets hit northern Israel, forcing residents of the area's communities to spend a considerable amount of time in bomb shelters. On April 18, an IDF unit operating near Kfar Qana, south of Sidon, came under heavy fire. During the rescue attempt, an artillery shell was fired at what was believed to be the direction of the enemy fire, inadvertently hitting a UN post in Kfar Qana, where dozens of villagers were being sheltered. Approximately 100 Lebanese civilians were killed, and dozens were wounded. International condemnation quickly ensued as the world demanded Israel end the operation, despite not having fulfilled its objectives. Shortly after the Kfar Qana incident, the United States began mediating a ceasefire between Israel, Lebanon and Syria. The mediation lead to the Grapes of Wrath Accord, signed on April 26, 1996, which stated all parties will refrain form involving civilian population in any military altercation. The agreement also stated that Hizbullah will cease its rocket fire on Israel and the IDF will halt firing at civilian targets in south Lebanon. The agreement also called for a monitoring committee to be formed in order to ensure the agreement was applied. The operation itself came under heavy criticism in Israel, as many claimed it was doomed to fail. The subsequent agreement was equally slammed, as the understandings seemed to imply that Israel recognized Hizbullah’s right to target IDF soldiers within the security zone and worse – agreed to rules effectively limiting any future response scenario, without gaining anything in return. Like the agreement following Operation Accountability in 1993, the Grapes of Wrath understandings did not stand the test of time. Not long afterwards, both sides began submitting complaints to the monitoring committee. However, the committee showed itself to be irrelevant and unable to enforce the agreement.